Following a slew of new Android apps, like Xbox Music and Office Mobile, Microsoft has now released Wordament on the Google Play Store. It is the first of Microsoft’s Android games to fully integrate Xbox Live achievements, allowing players to up their gamerscore from their Android device. Along with the new Android app, Microsoft updated the Windows Phone 8 app, moving it from native Windows Phone 7 to native Windows Phone 8, getting rid the letterboxing that many users complained of. The update also includes support for Norwegian and Turkish. 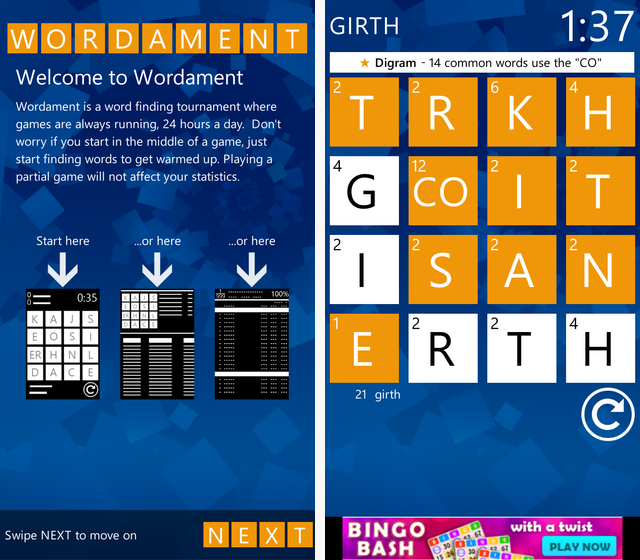 Wordament came to iOS about a year ago, and has been one of the most popular games in the Windows 8 store. The game involves tracing words out of a square of letters and competing with all the other Wordament users. Games occur every two minutes, with all players playing the same set of letters. You can log in with your Xbox Live gamertag or Facebook account, and if you’re connected to Xbox Live, you can earn up to 50 gamerpoints. Microsoft has been expanding it’s Xbox branding recently and adding more apps to its iOS and Android arsenal. Age of Empires is expected to land on iOS and Android soon, and users are going to expect a similar level of Xbox Live integration. Xbox is shaping up to become a cross-platform entertainment solution, but only time will tell where Microsoft takes it. What do you think of Wordament? Would you like to see more games on Android with Xbox Live integration? Let us know in the comments.